The “Lone Star” gemstone facet design was created by family members in 1974. 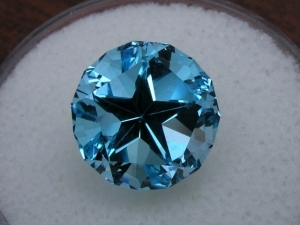 On May 25, 1977 the “Lone Star” design was adopted as the Texas State Gemstone Cut in House Concurrent Resolution #97. Dan Brown established Texas Gems as a company in 1974. Dan and Cathy facet several varieties of gemstones from rough materials and then mount them into custom made rings, pendants and earrings. “Lone Star” faceted gemstones are available in limited quantities in the observation room gift shop.